Apollo Bay is a coastal town in southwestern Victoria, Australia. Shop till you drop at High on Heels and Jo's Pantry. Get in touch with nature at Red Rock and Sheoak Falls. Venture out of the city with trips to Colac Botanic Gardens (in Colac) and The Razorback (in Port Campbell). And it doesn't end there: take a memorable drive along Great Ocean Road, play a few rounds at Apollo Bay Golf Club, take in the dramatic scenery at Carisbrook Waterfall, and take some stellar pictures from Mariners Lookout. Ask Inspirock to suggest an itinerary and make planning a trip to Apollo Bay fast, fun, and easy. Singapore, Singapore to Apollo Bay is an approximately 15-hour flight. You'll lose 2 hours traveling from Singapore to Apollo Bay due to the time zone difference. Finish up your sightseeing early on the 21st (Tue) so you can travel to Portland. Portland is a city in Victoria, Australia, and is the oldest European settlement in the state. On the 22nd (Wed), examine the collection at Portland Powerhouse Motor and Car Museum, look for gifts at Portland Strawberries, then learn about all things military at World War II Memorial Lookout, then visit a coastal fixture at Whaler's Bluff Lighthouse, and finally take in nature's colorful creations at Portland Botanical Gardens. Get ready for a full day of sightseeing on the 23rd (Thu): admire the majestic nature at Cape Nelson State Park, then visit a coastal fixture at Cape Nelson lighthouse, and then don't miss a visit to Point Danger Gannet Colony. For where to stay, ratings, reviews, and more tourist information, go to the Portland online journey planner . You can drive from Apollo Bay to Portland in 4 hours. In May in Portland, expect temperatures between 19°C during the day and 9°C at night. Finish up your sightseeing early on the 23rd (Thu) so you can go by car to Warrnambool. Warrnambool is a regional centre and former port city on the south-western coast of Victoria, Australia. Get outdoors at Port Campbell precinct and foreshore and The Twelve Apostles. Satisfy your inner culture vulture at Blarney Books and Art and Tower Hill Cemetery. Change things up with these side-trips from Warrnambool: Port Fairy (Griffiths Island Lighthouse & Russell Clark Reserve) and Port Campbell (The Arch & Gibsons Steps). Next up on the itinerary: look for all kinds of wild species at Thunder point Coastal Reserve, admire the striking features of Warrnambool Breakwater, enjoy the sand and surf at Logan's Beach, and work some fitness into your day at Foreshore Promenade. For where to stay, ratings, and other tourist information, refer to the Warrnambool online trip builder . You can drive from Portland to Warrnambool in 1.5 hours. Finish your sightseeing early on the 27th (Mon) to allow enough time to drive to Torquay. 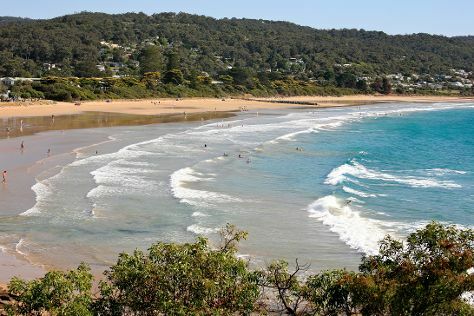 We've included these beaches for you: Lorne Beach and Bells Beach. Take a break from the city and head to Point Addis Marine National Park and Won Wondah & Henderson Falls. Venture out of the city with trips to Qdos Arts Gallery (in Lorne) and Aireys Inlet (Great Escape Books & Split Point Lighthouse). There's much more to do: identify plant and animal life at Coogoorah Park Nature Reserve, browse the fresh offerings at Torquay Farmers' Market, grab your bike and head to Anglesea Bike Park, and examine the collection at Australian National Surfing Museum. For other places to visit, maps, where to stay, and other tourist information, use the Torquay trip itinerary tool . You can drive from Warrnambool to Torquay in 2.5 hours. Alternatively, you can take a train; or take a bus. Expect a daytime high around 20°C in May, and nighttime lows around 8°C. Wrap up your sightseeing by early afternoon on the 2nd (Sun) to allow enough time to travel back home.